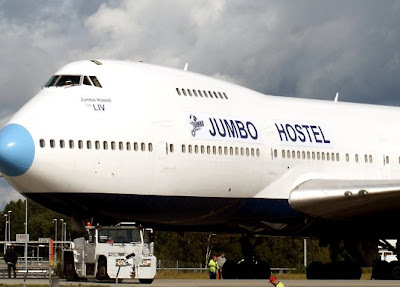 At first I thought it was a joke, so I am still evaluating what I think about sleeping in this 'jumbo plane' hostel in Stockholm. A inventive way to recycle, that is for sure. See more photos here and here. Thoughts? this is so unique! would love to stay there ! I have always felt that if you can make the travel part of the fun, then you're set. 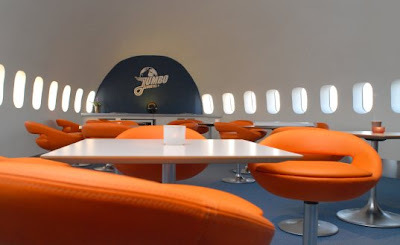 I don't like to fly, but that looks more inviting than a small seat in a cramped row and a tight seat belt. interesting idea & approach to decorating it! i LOVE this! plus, it looks nicer than some of the hostels i've stayed in. 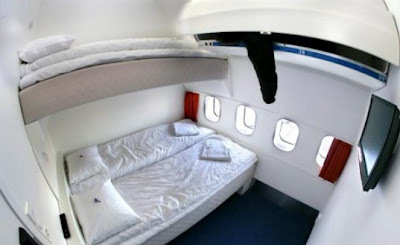 The captain's view from a bed would be pretty incredible. I'm in love. Completely. Although I don't know if I'd want to stay in one if there are long security lines. . .
Last time I was in Stockholm we met a some fellow travelers that were staying in a ship (in the water) that was transformed into a hostel - it was pretty cool... I think this jumbo plane looks exciting. Plus, Swedish hostels and the best that I have experienced! i wouldn't really care where i was staying if i had the chance to go to stockholm!